Royal Worlington & Newmarket Golf Club possibly has the finest nine-hole golf course in the world. It was certainly an incredible achievement to fit nine holes onto such a tiny piece of sandy ground and it's the only nine-hole course ever to have been voted onto a Britain & Ireland Top 100 list. This is a classical golf course, often referred to as Mildenhall and it’s the home of golf for undergraduates at Cambridge University. The turf has all the qualities of a seaside links, free draining and springy. Bernard Darwin loved Worlington and in his book, The Golf Courses of the British Isles, he wrote: “Worlington is not unlike Frilford in appearance, being extremely solitary, flat and sandy, and dotted here and there with fir trees. There are only nine holes, but of these several are really excellent, and none can fairly be said to be dull.” We agree, it is an engaging little course, but make sure you bring your best putting game – the greens are the highlight. Tom Dunn, who laid out the course in the early 1890s, reputedly said: “God meant this land to be a golf course”. Some thirty years later, Harry Colt lengthened it and little has since changed. Jo Floyd holds the course record. In September 1949, he went round nine holes in an incredible 28 stokes. He holed his second shot at the opening par five for an albatross two; this obviously lifted his spirits for the rest of the round. Three and four-ball play is not allowed at Worlington, foursomes and twosomes are the order of the day. Whatever you do, do not let this traditional approach put you off playing this historic nine-hole course; it offers the ideal golf day, especially if you can safely negotiate the infamous short 5th hole. “One may reach the green with a pitch from the tee,” wrote Darwin, “but what a difficult pitch it is. The green is something in the shape of a hog’s back; immediately on the left of it is a stagnant pool of water, and on the right is a stream, complicated by overhanging willows. To reach the green is one distinct feat; to hole out in two putts, when one has got there, is another.” The stagnant pool has long since gone, there is a grassy hollow there instead, but it’s still one of the toughest bunker-less par threes in the land. I’m clearly in the minority but still happy to be able to add the third 6ball review here. The course is full of delightful holes, but let’s start with the 5th. I can’t think of a better short par 3 (and that would include 6 at NGLA, 9 at Myopia, 17 at Sawgrass, 12 at ANGC, 11 at Castle Stuart, 14 at Doonbeg, 17 at LA North or Troon’s Postage Stamp). The green is difficult to describe but Tom Doak’s “vaulting horse” comes closest. And unlike the aforementioned holes, there are opportunities for a redemptive par with a variety of clubs if the green is missed. The preceding hole has another superlative—one of the most interesting fallaway greens I’ve ever seen. And the succeeding hole, a par 5, has a perfectly placed bunker to challenge the second shot, an area where many designers fall asleep. The home hole features a cape-like drive that forces the player to decide how much of the creek to cut off before playing a pitch to a fine bowl of a green. I won’t bore you with commentary on the rest of the holes, but there’s not a weak one among them. The fairways were not well-conditioned when I played in September 2018. But they weren’t any worse than the other rounds I played at a number of England’s finest courses on the same trip..
I’ve played over a hundred courses on this island, I can’t think of more than two dozen I’d rather play than here. I cant remember reading as “mixed” reviews of a course before, so wasnt sure what to expect when given the opportunity to play here. Having now done so, I can understand why some find it difficult to pin down a firm opinion and rating, but I am at a loss as to some of the reviews it has got, because it is surely undeniably a very good golf course. The first thing to be said about Worlington, and the thing I will remember it by, are the greens. Ive been lucky enough to play a handful of top courses, including North Berwick, Porthcawl, Royal West Norfolk and the Old at Sunningdale (albeit in Winter) and the mid march greens at Worlington are definitely the truest and quickest ive played on. Putts held their speed for an extra few yards than im used to, and over the 36 holes I played I noticed only one deviation in line the whole day. The bowl like complexes on the par 3 second and fifth are like nothing ive played on before, just sublime. The holes themselves are generally excellent - well thought out, well kept and strategically engaging through each time I played them. The fifth is the star - a top notch par 3 playing onto the best of the course’s greens - and the sandy, almost links style turf is an absolute joy to play off. It is a difficult course to rate. While sublime to play, things like the odd stray bunker, 1 or 2 holes not quite on the level of the rest (meaning 3 or 4 over 18), and a certain lack of aura in the setting (not least the proximity of the A11, the road running beside the first two holes and the recently fertilized farm next door) all push me away from wanting to give it a top score. I think much depends on how much of a purist you are when it comes to 9 hole courses - to put it this way, if a club in Surrey sand belt had 18 holes that played as well as the 9 at Worlington, with the green complexes, layout and conditioning it has, it is difficult to see it outside the top 30, even top 20, in the country and the course would be a comfortable 5 balls, knocking on the door of 6. For me the 9 hole status is enough to take that edge off, but given some of the courses ive given 4 balls to I feel duty bound to give Worlington that one better. On our annual trip to GBI, I took my group to RW&N, a course I played last when living in London in the 80’s. It took some convincing but it was worth the effort! A great layout, a very warm welcome, and fabulous to see how they fit 9 holes into such a small space. Don’t miss it. Something has changed here in the five years since I last played (review below 2/10/12) and I cannot put my finger on it. 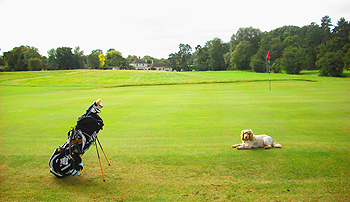 Back in 2012 I played well and it was a lovely day wandering around the course with my dog but I really didn’t enjoy the course and could not believe the ultra-glowing opinions that I had read in numerous publications. As Ed mentions in his words below from 2/6/17, the opinions good and bad are as wide as probably any course around. My recent visit was mainly to see if my original 2-ball ranking was too harsh and I have to say, yes it was – I certainly am not about to bang the drum for a world or GB&I position because in my opinion any 9 hole course, however good or improved cannot reach these heights. Condition and presentation was great and I did take the time to really look at every hole properly (played each 3 times) and to look at the land and run-offs and hopefully to see why it RW&N has some supporters at the very top-end of the ranking game. There is a little bit of me that understands the strong words, although most are still too glowing. I can now say that there is nothing to dislike about the course, yes there are some bunkers that are a little misplaced; the one forty yards in front of the first tee springs to mind (?) but overall I am converted. This happened once before to me when on first play, I was not that impressed with the Championship course at Carnoustie; half a dozen rounds later and I love it. In summary, yes I have a new opinion of the course, I had great fun, I can now see what all the fuss is about (to a degree) and I also respect why some may love it. I now concede that the Sacred Nine is a good course, not a great one but a solid good course – my direct comparison back in 2012 was between this and Surrey’s best nine hole course at Reigate Heath – my choice has not changed, Reigate Heath must be ranked higher, especially as there are different tees to use when playing the nine holes twice. In terms of course opinion maybe first impressions are not always the lasting ones. Royal Worlington & Newmarket at Mildenhall is a golf course that I have wanted to visit for a long time. Much has been written about this charismatic club over the years since it’s foundation in 1893. It has received high acclaim from many respected sources but likewise has had its detractors too. Having heard it described as little more than a field with nine flags in it to being dubbed as the greatest nine-hole course in the World, it’s clearly a course that divides opinion. I really just wanted to go there with a neutral mind-set and arrive at my own conclusion. Some have said it’s not an easy course to gain access to, however, I had no problems in this regard. I simply called the Secretary on the morning I intended to play and was advised that I would be warmly welcomed at my anticipated arrival time of fifteen hundred hours. I was even told that I would pay the twilight green-fee despite this not coming into effect until an hour later. My cheery reception duly arrived and I was also greeted with the issue of an insurance certificate; ‘Just in case you kill anyone’ I was told by the lovely lady at the other side of the hatch in the olde-worlde clubhouse and to whom I handed my green-fee. It soon became apparent that this protection was because of the public road that runs the length of the first hole and that also cuts right across the front of the ninth green. However, as I would only find out a few holes later, it could also be for those who are driven to murder after chipping back and forth across the fifth green for the umpteenth time. This timeless course receives architectural praise for the routing in such a compact area (to achieve this you drive over the green of the previous hole on a number of occasions) but, perhaps selfishly, I’m not too interested in that. I’m more concerned with how the course plays and in this regard Royal Worlington ticks all the boxes. The sandy, links-like soil produces great turf from which to play but it is the green complexes that elevate this to being one of the UK’s best courses, never mind all this ‘best nine-hole’ business. Believe me, this is the real thing. Or at least anyone who doesn’t like Royal Worlington & Newmarket has a different definition of ‘golf’ than I do. I genuinely don’t understand why Worlington polarises opinion as it does. For me this is the real deal and still relevant in the 21st century. We play here annually as part of our Suffolk trip and we play 36 and embrace the full RW&N experience. I love it and despite having played it dozens of times, the greens still confound me. It’s the variety of green complexes that are the stars of the show here and for that reason alone it belongs in a class of its own. Once maybe RW&N was overrated now it’s definitely underrated. Had the pleasure of playing this traditional inland Links Course for the first time, and whilst it 'looks understated', it's this simplicity that actually makes it a pleasurable golfing experience. The green structures constantly keep you on your toes and offer an array of challenging breaking putts, and puts a premium on ball placement throughout your round. The highlight of the course is the par 3 5th hole. Whilst not a long par 3, you have to be accurate as the green slopes viciously either side leaving a desperately difficult chip shot - a true test! A wonderful walk back in time to a more traditional time of when golf was originally played. I really enjoy both aspects of the new 'super' courses and facilities but the opportunity to play a course like Royal Worlington & Newmarket is a must for an avid golfer. Played here last Saturday-what a treat!This course is as much about the experience as the course itself..superbly understated clubhouse that all adds to the visit-do try the Pink Jug house drink after 9!Its a two ball or 4some course only but again that all adds to the experience...generous fairways but VERY tricky and large greens..No 5 is an all world par 3 of 160yds.Decent length for a nine holer(what fun to play a top class 9 hole course in 90 minutes!) with a good blend of holes make this a must play...Is it the best 9 holer in the world?not sure but it is the best 9 hole experience in the world that i have had the pleasure of playing..Golf as it was intended to be played and enjoyed! Looking at the various reviews of the course since 2004 on this site, opinion is very much split about RW&N. I have had this on my want-to-play list for a long while mainly just to see which way my own thoughts would go. After playing hundreds of courses around the world, I hope I have a fairly balanced view now, so here goes…… oh dear! I have to say I am not a fan and am severely under whelmed by the nine holes. The opening hole is a non-descript par-5 with very little to be excited about – The 2nd hole I quite liked, 224 yard par-3 with a very tricky green – The 3rd is a short par-4 which is ok but the club website says about the hole, “surely one of the best golf holes anywhere” – sorry but whoever wrote that needs to get out more! Another par-5 at the 4th which is much better than the 1st hole but still fairly average. The par-3 5th gets many positive comments and yes, the green site is strong and will catch out many approaches but is the hole that good? The 6th hole is probably the pick of the bunch; a 460 yard par-4 and a decent hole – another par-3 at the 7th, which is just average at best. Turning back towards the clubhouse at the 8th tee and another tough par-4 which is ok and then the final hole is a short par-4 turning right and a nice looking hole but as a challenge against par, not that tough really. The club will complete 120 years of history in 2013 and there are many tales to be told, plenty in their centenary book, “The Sacred Nine” – which is a good read. The club has to be respected and connections to nearby Cambridge University remain strong but if I am reviewing just the course, then I am very disappointed. Also in a direct comparison with the 9 holer at Reigate Heath in Surrey, Worlington is a long way behind in my opinion. Some of the best green structures I have ever played. Other than that, an average parkland course, which is surprisingly difficult to score well around.